Review by Karen Topham, American Theatre Critics Association member; photo by. There is a true story at the core of BoHo Theatre’s new musical Bright Star. Or at least a legend. Just after WWII, a baby was tossed from a train in North Carolina’s Blue Ridge Mountains. Dubbed the Iron Mountain Baby, he was raised by strangers who found him. Steve Martin and Edie Brickell picked up that thread and wove a warm, relatable story of love, pain, loss, forgiveness and redemption around the story of that baby. Bright Star’s plot revolves around Alice Murphy (Missy Wise), the editor of a magazine based in Asheville, NC. Alice finds herself playing mentor to a young writer named Billy (Jeff Pierpoint) who has talent and chutzpah but lacks a strong story to tell. And Alice knows stories: her own life has been one. At eighteen she fell in love with the mayor’s son Jimmy Ray (Josiah Robinson) and found herself pregnant. Her strongly religious father (John B. Boss) and the mayor (Scott Danielson) force her to give the baby up for adoption, and that loss has colored her entire life. As a mystery, Bright Star is pretty easy to solve: anyone paying a modicum of attention should be able to tell what is going on before intermission. But the mystery isn’t as important as the people involved in it, and the more we get to know them the more likable they become. Wise is a gifted actress and this role showcases her powerful voice as well as her emotional range. Pierpoint is also strong as the would-be writer from a small town who learns how to navigate the treacherous waters (alcohol! women!) of the much larger Asheville while seeking his story. His central song, “Bright Star,” shows his optimism: he has a great deal of confidence in his ability as a writer; he merely lacks the experiences to write about. The other actors are equally adept. Robinson is a compelling performer, making Jimmy Ray more than capable of holding his own against his imposing father. Danielson’s commanding presence is especially authoritative in “A Man’s Gotta Do,” as he does the only thing he thinks he can do in order to preserve his son’s future, an action that ironically tears the two apart. The women too are impressive. Jenny Rudnick is highly sympathetic as Alice’s mother and Kiersten Frumkin is particularly appealing as Billy’s hometown sweetheart. Meanwhile, as Alice’s assistants at the magazine, Rachel Whyte and Dwayne Everett threaten to steal the show at every turn. Ericka Mac directs all of this with a deft hand, keeping scenes alive during changes so that the whole show is practically seamless and choreographing the dance sequences (especially Whyte’s energetic “Another Round”) with great imagination. She is aided by a simple but clever set design by Lauren M. Nichols and brilliant lighting by G. “Max” Maxin IV. Mac also knows how to feature Julie B. Nichols’ seven-piece bluegrass band, which (with some onstage help from several of the actors) is lively and energetic throughout the show. 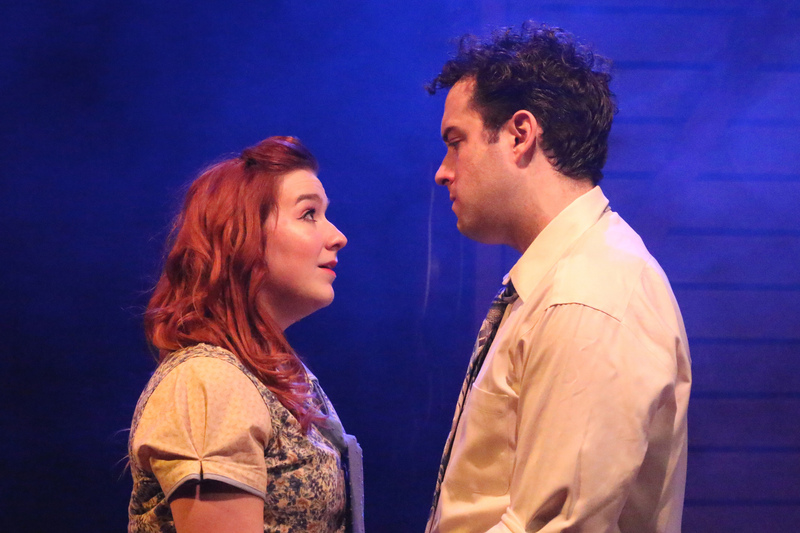 Bright Star is a BoHo Theatre production now playing at the Greenhouse Theater Center, 2257 N. Lincoln through May 5. Check the website for specific dates, times, and tickets. Find more information about current plays in our front page recs and attheatreinchicago.com.